When I first heard that Betty Ross was the new Red She-Hulk, my initial reaction was to roll my eyes. I mean, c’mon. She’s a support character, not a main character. She’s Bruce Banner’s love interest! It’s a trend I have noticed a lot, where supporting characters are suddenly heroes on their own. I am concerned with this trend, as every hero needs a support crew. Yet I had to ask myself if there was something more to this. So I picked up Red She-Hulk – Volume 1: Hell Hath No Fury. I have to say that I was pleasantly surprised. 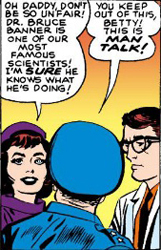 In other words, Betty Ross is completely boring. Oh, she’s had her moments, but has she ever stood out on her own? Enter the Red She-Hulk. This is Betty Ross, transformed into a Red Hulk, much like her father. Suddenly, she has gone from a supporting character to being in the spotlight. For the first time, she seems interesting. And yet I have to wonder if we have too many Hulks running around. Two Hulks, two She-Hulks, and how many other spin-offs? Some of the naming conventions are weird too. While that criticism may hold some water, I think the pros outweigh the cons here. Betty Ross, for the first time, feels like a fully-developed character. I look forward to reading more about the Red She-Hulk.